The first thing that comes to mind when you look for trekking to Everest is, “What is the altitude where I will be traveling to?” This is a question that you should ask yourself to know about the geography of the region. And to prepare well for the trek you are going to undertake. The altitude profile is dependent on the travel packages that you undertake. Your actual trek starts generally from the Lukla airport, which is at an altitude of 2800 meters. 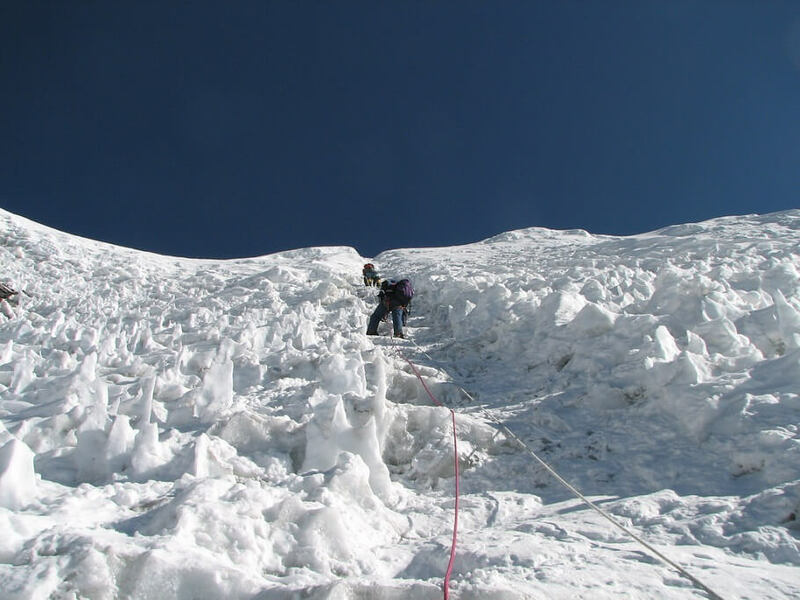 If you are thinking of climbing the Everest itself, you will be at the top of the highest peak on the Earth i.e. 8848 meters. But a trekker to the Base Camp doesn’t have to climb that high. In fact, the Base Camp is at an altitude of 5365 meters. The weather of the places that you encounter along the way depends on the altitude. The lower altitude regions are quite warm when compared to the higher altitudes. So, the wind in the lower altitude regions seems to be harmless too. Also, the seasons which you decide to trek will determine the temperature. In this article, I will give you a glimpse of the various trekking routes available in the Everest region. Along with the various altitudes of the places that you are likely to encounter along the way. A Helicopter trek is perfect for people who want to experience the beauty of trekking without allocating much time on trekking. This trek also reduces the strain in your body as you don’t have to trek in very high altitudes. To complete this trek, you will first have to come to the capital city of Kathmandu, which is at an altitude of 1400 meters. Short hikes around the hillocks in Kathmandu can be a very good way to train your legs. And to get used to some altitude and steep, sloppy trails. People who have lived all their lives close to the sea level can go to places like Nagarkot. The place is scenic, cool and helps in warming up for the Everest trek. From Kathmandu, you will fly to the thrilling Lukla airport at an altitude of 2800 meters. From Lukla, you will go to Phakding which is 200 meters lower than Lukla is. From Phakding you will go to Namche Bazaar. Namche Bazaar, the city-like place shown in movies such as Everest, locates at an altitude of 3441 meters. You will also get a chance to go to Thame and be back to Namche Bazaar. Thame is 3800 meters above the sea level. From Namche Bazaar, you will have a chance to visit the Base Camp as well as Kala Pathar in a helicopter. And then you will be back to Lukla on your way back to Kathmandu. This means that you will trek for 4 days in the Everest region. 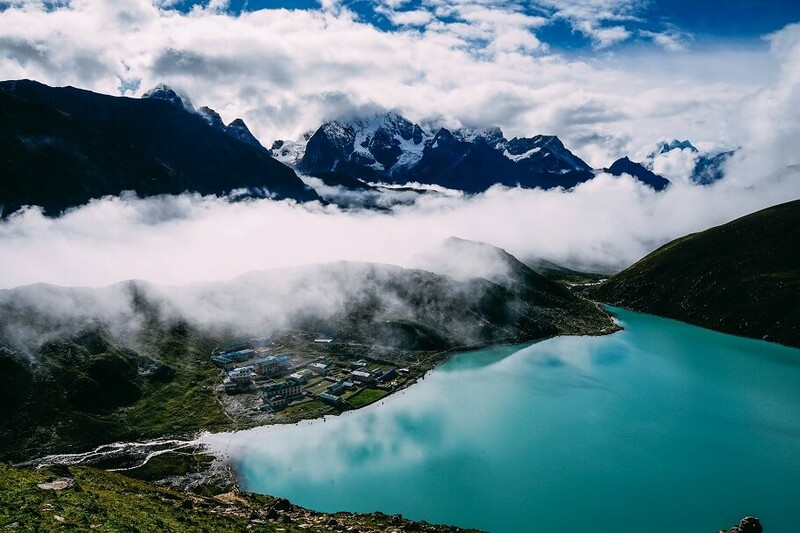 If you are looking for something demanding and want to complete your trek in around two weeks, Gokyo valley trek is the one you should look forward to. Gokyo valley is a wonderful valley in the Everest region which is full of mountains, lakes and beautiful skies. 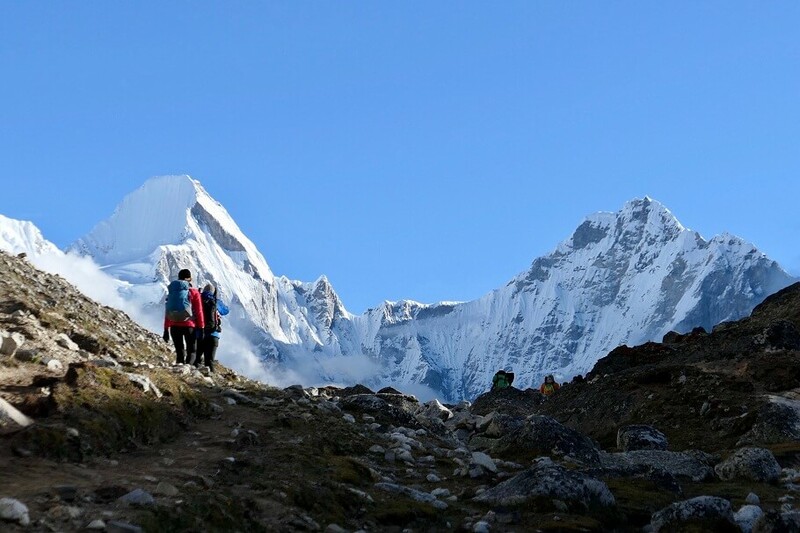 Your trek will start in the same region as the Everest Heli trek. You start from Lukla to Phakding to Namche Bazaar. After acclimatizing in Namche Bazaar, you will go to Phortse Thanga, at an altitude of 3680 meters. Then you will go to the Maccherma, which is 4470 meters high. You should spend a day in each of these places to get accustomed to the climate as well as the altitude of this place. From Machherma, you will go to the awesome valley of Gokyo. This village is at the base of the third of the Gokyo lakes called Dudh Pokhari. Gokyo valley has a height of 4790 meters. From here you will go to Gokyo Ri at an altitude of 5483 meters. From Gokyo Ri, it is possible to see Mt. Everest, Mt. Lhotse, Mt. Makalu and Mt. Cho Oyu. All these peaks are taller than 8000 meters. From Gokyo Ri, you will trek back to Namche in 2 days time. Island peak treks will last for 21 days. This extensive trek should be well prepared for. You will see many places in the Everest region. Like other treks in the Everest region, this trek starts from Lukla to Namche. From Namche Bazaar, you will go to Tengboche at an altitude of 3860 meters. You will also get to see the Tengboche monastery in this region. This is a monastery that has high spiritual values in the Everest region. From Tengboche, you will trek to Dingboche. Dingboche is a Sherpa village that is 4350 meters high. From Dingboche will go to Nangkartshang peak which is over 5000 meters i.e. 5083 meters. 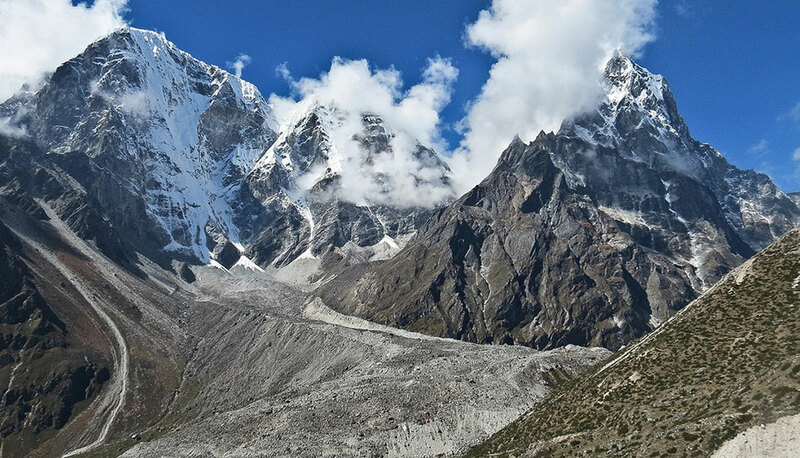 Next day, you will descend to Lobuche which is 4910 meters and then trek to the Everest Base Camp. Everest Base Camp is at an altitude of 5365 meters high. Ascend to Kala Pathar at a height of 5555 meters gives you the best view of the Everest peak. From here you get a walk to the Island Peak Base Camp. The island peak has a height similar to the Everest Base camp i.e. 5240 meters. The Base Camp is the starting point for the Island Peak. The Island Peak will be the highest point that you will reach. It is 6187 meters high. From Island peak, you will get down to the places that you have trekked from all the way to the Lukla airport. Jiri trek is the best one that you can encounter. This trek starts from Jiri, a place you will drive to, from Kathmandu. Jiri, located at an altitude of a mere 1900 meters is the starting point for Classic EBC trek via Jiri route. From here you will go to Bhandar, which lies at an altitude of 2200 meters. From Bhandar you will go to Sete (2645 meters) to Junbesi (2675 meters) to Nunthala (2440 meters) to Kharikhola (2020 meters) to Puiyan (2700 meters) and finally to Phakding. To get enough rest and acclimatizing with the changing altitude, you will have to spend a night at each of these places. From Phakding, you will go to the places mentioned above. Animal rearing and tourism are the two ways people earn a livelihood in this region. Therefore, life is harsh in places with harsh climatic conditions. The only way to transport goods in this region is by the means of airways. And airfare means high transportation charges in Nepal. So, the price of food, drinks, and other items in this place is slightly higher than you may encounter in other parts of Nepal. The native people here are Sherpas, some of the strongest men in Nepal who survive in such a difficult climate. As Sherpas dominate this place, it should come as no surprise that their culture has Tibetan influence. Besides Sherpa, the ever-present Brahmins and Chhetris are also present in the Everest region. This makes the place culturally rich and religiously diverse. The main religion of this region is Tibetan Buddhism. As this place is near the Tibetan border, you expect the religion to have high influence Buddhism. There are several Buddhist monasteries in this region to see. The most famous of them being the Tengboche Monastery. You might say that the Everest is extremely cold and it is definitely true. But, the temperatures can be high during the daytime in the summers. In hot summers, the daytime temperature can reach as high as 25 degrees. But, the temperatures in the daytime in the summers can reach as low as an average of 8 degrees in January winters. Needless to say, the wintertime temperatures go below the freezing point of water. If the cold gets extreme, the temperature can be as low as -15 degrees. It is difficult to pinpoint a particular temperature for a day of a month. This is due to the fact that the temperatures in the mountain region are unpredictable. A Harsh wind that can blow as hard as 12 mph brings weather changes in mountains. Good clothing will come in handy when you are planning for a trek to Everest. For best and easy trekking, you need to carry Down jackets, water-resistant boots, and trousers. Along with moisturizers, winter hats, gloves, socks, trekking poles, and anti-theft backpacks. And, backpack chargers, basic first-aid equipment, water purifying tablets, torch, and a few backup clothes. There are various ways in which you can go to the Everest region. The length of the trek depends upon how many places you want to see and how much time you have in hand. The altitude of Everest region is quite high. As it lies above 3000 meters you will have to go slow in your treks and give your body enough time to acclimatize. Sleep will be of the utmost importance too. It is always good to do a background check all the things that are necessary for you to know before undertaking the trek. That way you will be fully prepared for anything that comes along the way. And, it includes the climatic conditions and altitude too.